This movie is what the Expendables and the Losers should have been. The plot is formulaic at best--former secret agents targeted for assassination, but what makes the film work is their RED status (retired extremely dangerous). This film deals with what the other films avoid, what happens when you get old? The primary strength of the film is the cast, most of whom need no introduction: Bruce Willis, Morgan Freeman, John Malcovich, Helen Mirren, Mary Louise Parker, Karl Urban, Richard Dreyfuss, Brian Cox, Julian McMahon, and most surprisingly Ernest Borgnine. Ernest Borgnine's presence in the film was particularly wonderful. There are so many older actors, who don't get work anymore, even though they are perfectly capable to do so. Also, Helen Mirren, in an evening gown with a machine gun = worth the price of admission. Plot: Frank Moses (Bruce Willis) is a former CIA agent, living out his silver years in Cleveland, yes Cleveland. After a life of toppling dictators and assassinations, his personal life is non-existant. As a retiree, the closest thing he has to a girlfriend is fellow lonely heart and customer service represenative Sarah (Mary Louise Parker), who works for a government pension office in Kansas City. Frank frequently calls Sarah regarding his "misplaced" pension checks, only to exchange gardening and cooking advice. Inevitably they develop feelings for one another. Frank and Sarah meet sooner than expected when a group of unknown assassins come to Frank's house in the middle of the night. Knowing that his phone was probably tapped, Frank goes to Kansas City to rescue a reluctant Sarah. On the run from fellow CIA agent, William Cooper, played by one of my favorite actors (Karl Urban), Frank and Sarah begin their adventure. Needing a little help from his friends, Frank pays a visit to his former colleagues, starting with Joe Matheson (Morgan Freeman). The rest of the film is spent "geting the band back together," as Joe eloquently says. What follows is so much fun to watch that I won't spoil it any further. The film's casting was definitely it's strong suit, but the writing should not be underscored. The casting would have been for naught, had the writing been subpar. Thankfully, the writing was fresh, witty, and good-humored. Another thing that worked well was the music. The selection of blues music throughout the film gave the film a soulful touch. This movie is not oscar material, but it's a movie that I would watch again, which makes this a first-rate popcorn flick. I enjoyed the film, although perhaps not as much as you. I liked pretty much all the scenes with John Malkovich. I loved the bit where he suspected the woman at the airport. 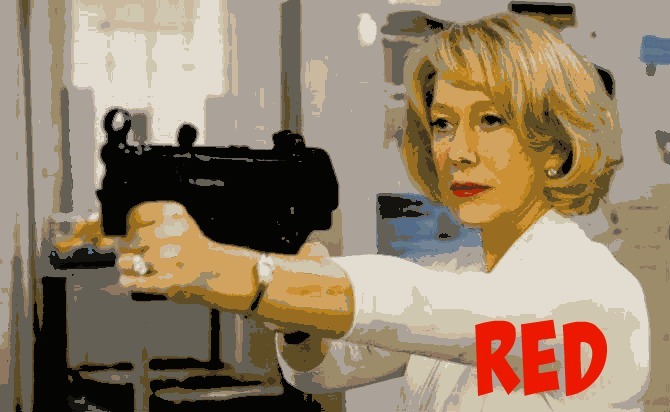 Seeing Helen Mirren firing big guns was a bit of a brain fry. I found her potential romance with Brian Cox's character more interesting than Willis' potential romance.